You all have come across with the water-logged streets in your surroundings during the monsoon seasons or due to sewage blockage too. Due to which many accidents like vehicles drowning seem to occur on the road. Today, we are talking about the viral video of one incident in which a car didn’t drown but it got to fly high from the ground. Hope, you all are thinking how a car can fly. 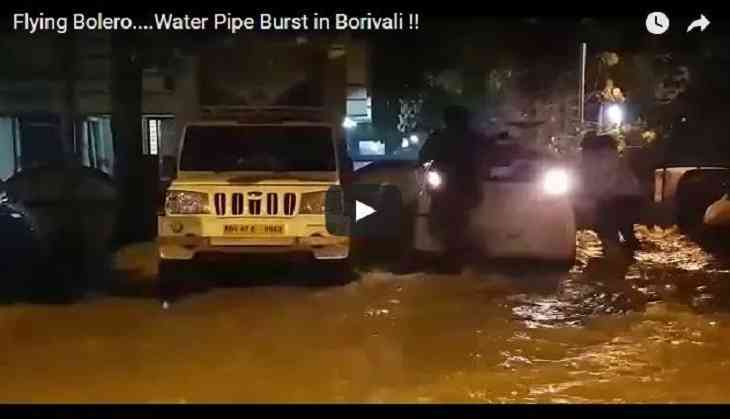 The incident had occurred in Borivali, where many cars got stuck in the water-logged street. Well, about this we are not talking, the amusing thing that comes to light is that all of sudden a pipe burst due to which Mahindra Bolero was tossed in the air. Hope, you won’t believe on this but you will be amused to see the viral video in which more than 1.5-tonnes car got to fly. Do you saw the intensity of water that all of the sudden outburst and tossed the Mahindra Bolero in the air? However, the injury details to the occupants aren’t available. It was also unknown that any other vehicle could also escape without much damage. As per the reports, the water supply to Borivali-Kandivali-Dahisar West area has been hampered due to this breakdown.